Asparagus Soup Recipe With Wine & Cheese | Homemade & Yummy Homemade & Yummy | Fun delicious recipes and more. Asparagus Soup Recipe With Wine & Cheese is so easy to make. Elegant enough to serve to dinner guests. Entertaining should be easy and delicious. 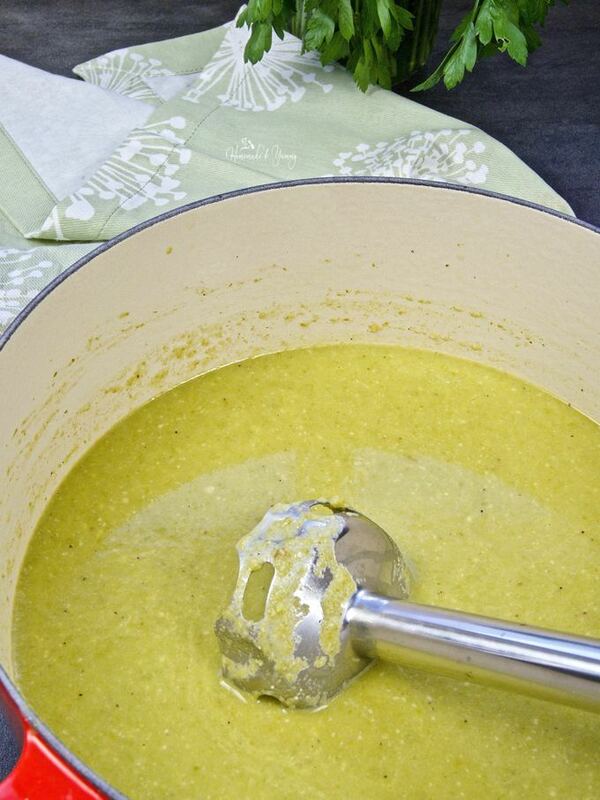 This asparagus soup recipe combines wine and cheese for the perfect start to a great meal. Do you like cooking with wine? This is a sponsored post for Woodbridge by Robert Mondavi Wines. I have been monetarily compensated, all opinions are my own. PLEASE ENJOY WINE RESPONSIBLY. Well, I think SPRING has finally decided to make an appearance. I know according to the calendar, this happened weeks ago. According to the temperature, it only happened this past weekend. Not sure about where you are, but just over a week ago we were covered in ice. This easy to make asparagus soup recipe combines fresh asparagus, leeks, white wine and parmesan cheese. Beautiful green in colour, light, and refreshing in taste. The perfect way to celebrate SPRING! Do you enjoy wine? We are total “wine lovers” here. Our idea of a perfect afternoon is enjoying a glass of wine (or two) with a nice assortment of crackers and cheese. With the warmer weather on the way, sitting out in the backyard is even better. How about a Wine Spritzer Bar for easy entertaining? Your guests will LOVE it!! 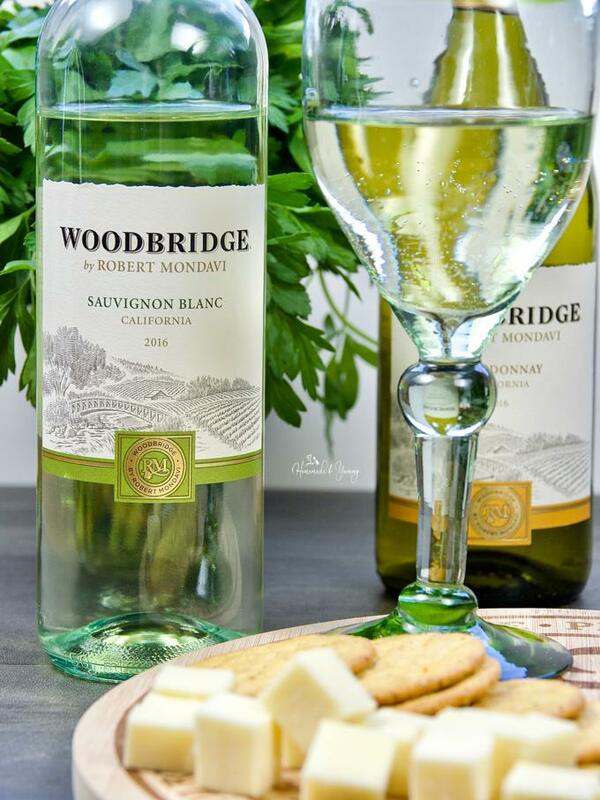 Have you tried Woodbridge by Robert Mondavi Wines? This California based winery has a GREAT selection to choose from. Bright fruit flavours and smooth finishes make them the perfect compliment to enjoy from appetizers to dessert. 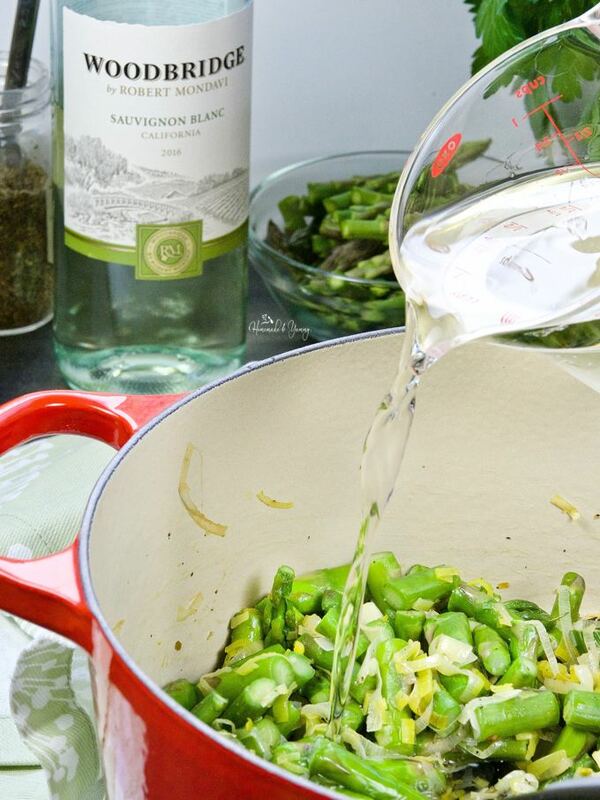 Cooking with wine adds another element of flavour to recipes. I recommend NEVER cooking with a wine you would not drink. You all know the famous Julia Child’s saying: “I enjoy cooking with wine, sometimes I even put it in the food”. I have this hanging on my kitchen wall! Cooking with wine produces GREAT dishes, and recipes like classic sabayon will WOW your dinner guests every time! Since wine and cheese pair so well together, combining them into a delicious soup recipe is a great idea, especially when it is super easy to make. Asparagus is a true sign of spring. The refreshing acidity from the wine, along with the fruity, nutty taste of the Parmesan will get your taste buds dancing. Having a glass of wine while enjoying this soup ties it all together. When it comes to cooking with wine, the pairings are endless. For this soup recipe, I selected a Woodbridge by Robert Mondavi Wines Sauvignon Blanc. The flavour is crisp and bright with a hint of citrus. 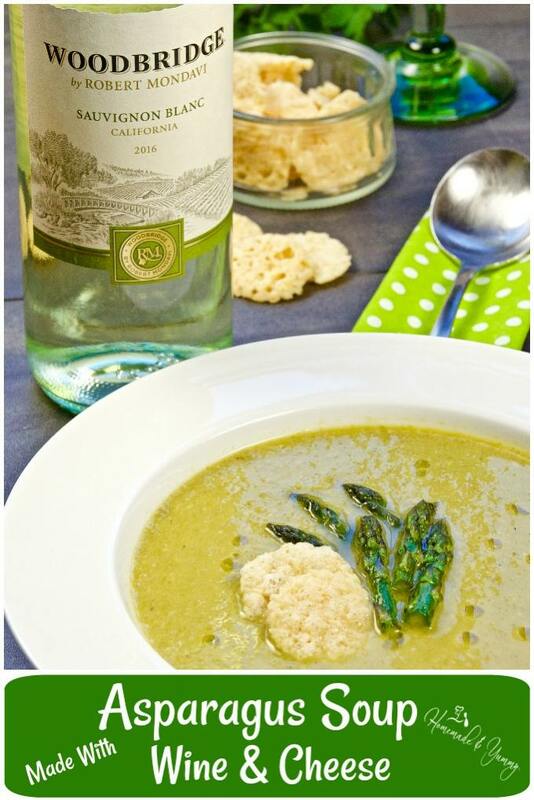 A great wine choice for this fun and delicious spring soup. For more tasty food and wine ideas, be sure to visit Woodbridge by Robert Mondavi Wines for tips and a wine pairing app to help you with your serving selections. 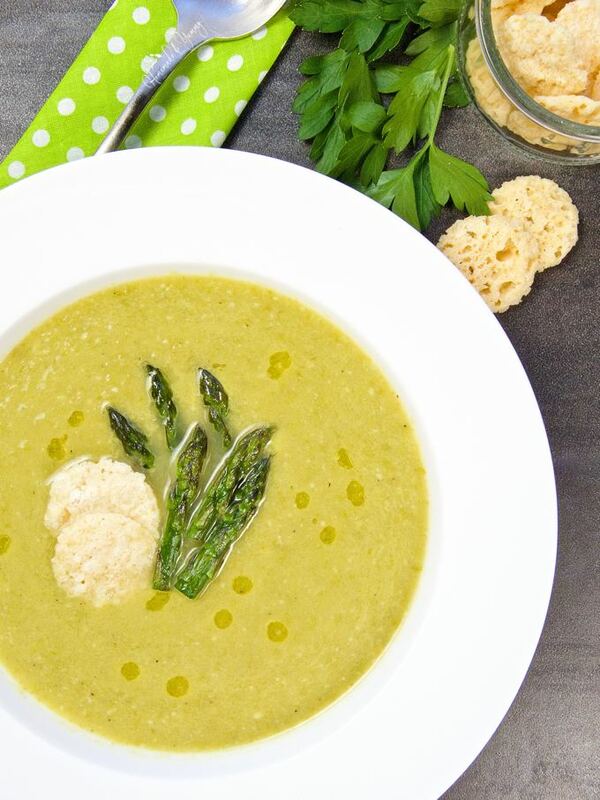 Let’s talk about how easy this asparagus soup recipe comes together. With a few simple ingredients, your guests will think you spent hours in the kitchen. As you read the recipe, you will see this soup easily comes together. You can make it ahead of time if you wish, and warm it just before serving. If you don’t have an immersion blender, you can purée using your counter top blender. Be sure to do it in batches so you get a nice, smooth consistency. Asparagus Soup Recipe With Wine & Cheese is thick and smooth with a nice wine and cheese flavour. Topped with some sautéed asparagus tips, lemon oil, and a few Parmesan crisps, this elegant soup is the perfect start to your dinner party. We enjoyed it alongside a salad for dinner too. Next time you are looking for a new wine to try, look for Woodbridge by Robert Mondavi Wines. Check out their collection in the California section of your local liquor store. Woodbridge by Robert Mondavi Wines makes fine wines for your enjoyment. Be sure to follow them on Facebook, Twitter, and Pinterest. Asparagus Soup Recipe With Wine & Cheese is so easy to make and elegant enough to serve to dinner guests. The combination of wine and cheese create a flavourful soup that is the perfect start to your dinner. Wash and thinly slice the leeks (white part only) and set aside. Wash and cut asparagus, saving some of the tips to cook and use as garnish. Heat 2 tbsp. of olive oil in a heavy bottomed pot over medium-high. Add the leeks, lemon pepper and salt. Sauté for 5 minutes. Add the wine, and cook to allow the alcohol to evaporate (about 10 minutes). Add the chopped asparagus, sauté for 5 minutes. Add the chicken stock, bring to a boil, reduce heat to medium and cook until asparagus is fork tender. (about 15-20 minutes). While the soup is cooking, sauté the asparagus tips in a pan with the additional 1 tbsp. of olive oil. 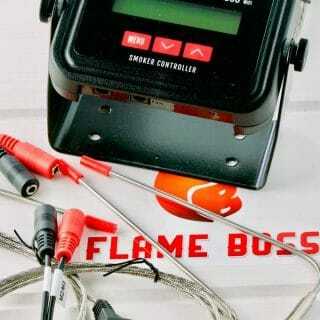 Set aside till ready to use. Once the asparagus is cooked, remove the soup from heat. Purée until smooth (using your preferred method). Add the Parmesan cheese, and mix to combine. Garnish with the asparagus tips, several drops of lemon flavoured olive oil and a few Parmesan crisps. I love love love fresh asparagus and it’s in season here now too. I’m liking the addition of white wine and cream cheese to give it extra richness and decadence! Well I hope you give this recipe a try. It is easy, and perfect for serving to dinner guests too. 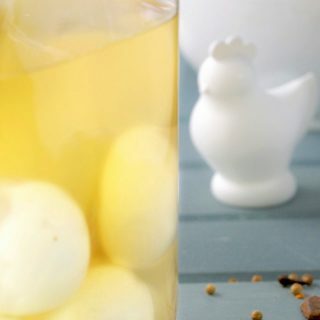 It is such an easy recipe…hope you give it a try soon. I love asparagus soup! 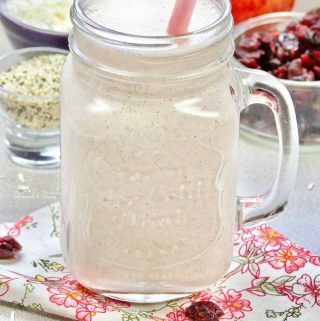 This look delicious and easy! YES and YES….hope you give it a try. This sounds delicious – I just love asparagus in anything this time of year! We enjoy it all year long….such a great veg to work with. This soup scream spring all over! I’m finding loads of fresh asparagus at the local market, so I’ll give it a try soon! It is a winner….and elegant enough to serve to dinner guests too. This soup looks so sophisticated! I can imagine that it would be the best on a chilly, rainy, spring day! Yes….but perfect any day of the week too. I picked a few bunches of asparagus last week on sale at the grocery store. 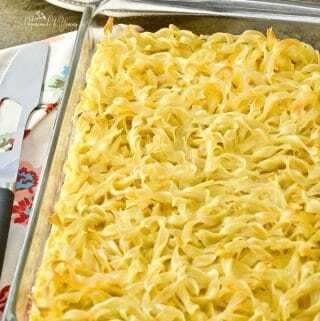 I told the hubs I’d try new recipes with it and this one looks easy to make and delicious. 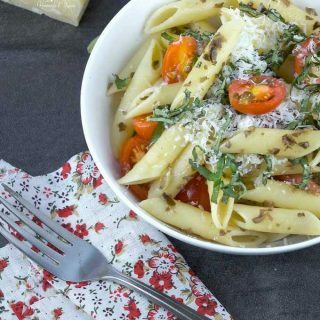 Can’t wait to make this for dinner next! Enjoy….hope you give it a try soon. Asparagus usually elicits an instant bleh from me but yours actually has me craving some of that soup! Lovely pictures too! Well then I suggest you give this tasty recipe a try soon. This dish just epitomises everything about spring. I love asparagus season – how delicious! Yes we really like this version of soup for sure. Yes is sure does…from colour to taste!! This is just Spring in a bowl! Lovely flavour combinations and I love the lemon olive oil as a garnish! I’ll have to try and find some to try it. I love flavoured oils….such a great addition to the pantry…..and when I go to the store….so many bottles I do bring home. 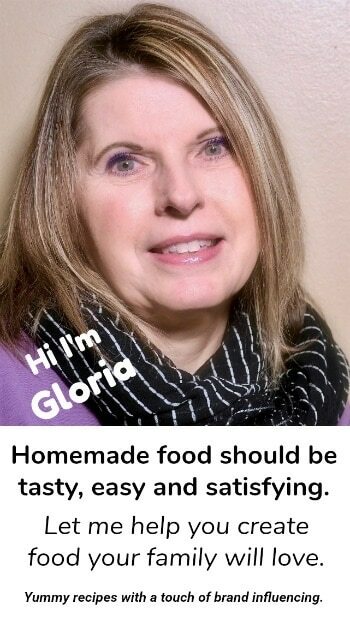 Oh Gloria, this soup looks absolutely delicious! To me nothing says spring more then asparagus. I currently have some in my fridge and I think I’m going to have to make this! Asparagus is awesome, as is wine and cheese! I’ve never had asparagus soup, which is surprising. I bet it’s delicious! It looks amazing and definitely something I’d like to try. So delicious. Hope you give it a try soon. I’m not gonna lie… I didn’t even know asparagus soup was a thing. I’m so glad I saw your recipe, because I LOVE asparagus! WELL….I guess you really need to get into the kitchen and give this awesome recipe a try soon. 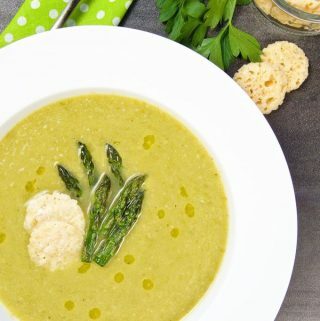 I love asparagus soup – but I’ve never made it with either cheese or wine, and that sounds like a wonderful combination! I believe we even have some of the Woodbridge in the house…. and I know I have the cheese… I”ll have to look into this! Maybe a farmer;’s market trip tomorrow? Well ENJOY!! Both the trip to the market…and the soup. Be sure to have a glass of wine too!! What a beautiful bowl of soup! I love that you used smoked sea salt. I’ll definitely be trying this. Hope you do. I know hubby is already asking when will I make it again? I guess that means soon. 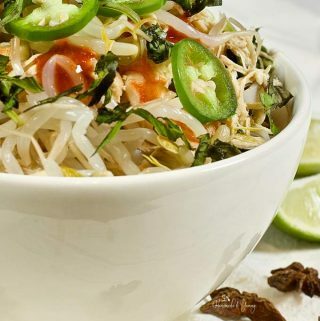 This looks delicious and sounds so flavorful! I need to try asparagus soup. Well this recipe is easy and so delicious. Hope you give it a try. Awesome combination of flavors for this soup! Thanks for sharing!! Yes…it is quick, easy and totally delicious. Just wanted to let you know we made the soup and it was terrific. We didn’t have the lemon olive oil but we did have garlic. We were out of the lemon. I go nuts in the olive oil store. We also go crazy with balsamic vinegar. Since asparagus is in season, it’s just the right time to make the soup. THANKS so much for letting me know. So glad you enjoyed the recipe. This is the PERFECT soup for spring, all of my favorite flavors! I cannot wait to make this! I just know it’s going to be a crowd pleaser in this household. It is super simple to make….and the perfect start to a meal. This asparagus looks scrumptious Gloria, perfect to host a party. I tend to cook leeks the way you do with some wine, it makes some seriously delicious broth that I like to freeze and use for my sauces. 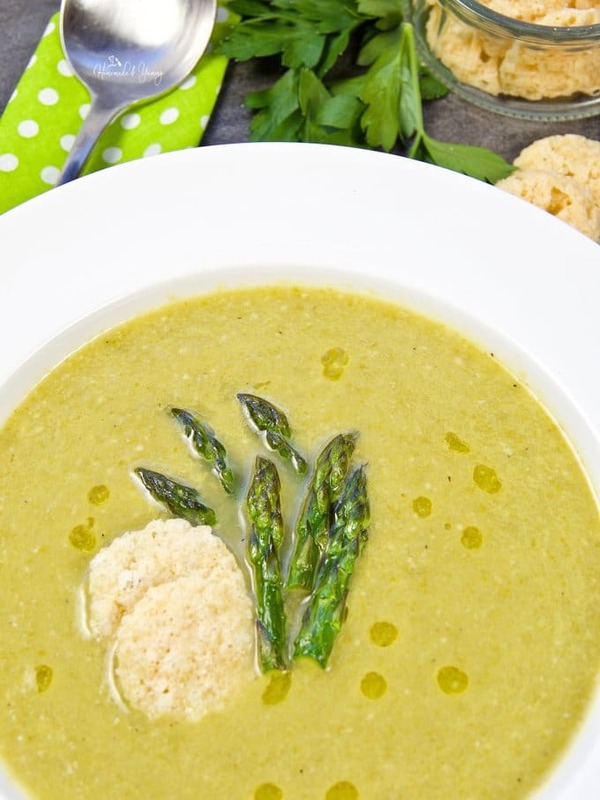 I love all the ingredients in this asparagus soup and will try it, I know we’ll love it! Well hope you give this a try. 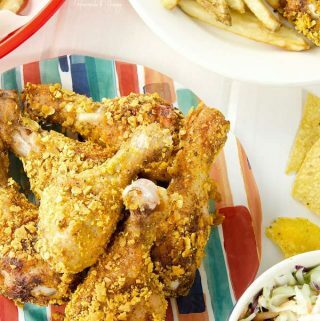 It is super easy and perfect for entertaining. Three of my favorite things! Wine, cheese, and asparagus combined into a soup sounds like heaven! I can’t wait to try this, and I love Robert Mondavi wine so this is perfect! Making this for a light supper tonight. I love the addition of the Parmesan crisps! This soup is super easy. ENJOY!! Oh my… this soup looks really delicious – creamy and flavorful. I absolutely love it. Asparagus is one of my favorite Spring veggie. I never tried asparagus soup thou. Now I just must try it. I’m making this asap. Hope you give it a try….it is so easy and delicious. And the perfect start to a meal. I just love asparagus soup. We had it quite often as kids and whenever I have it now it reminded me of my sister. HAHAH…well I am glad I could bring back some wonderful memories for you. This is an amazing recipe with lots of flavors, asparagus is plentiful here in Florida! Yes we love asparagus…especially in the spring and summer. Wine and cheese is my favorite. I love wine more when it is cooked with it. Your asparagus soup become gourmet with wine and cheese. Best part is that while cooking I can enjoy glass of wine. YES….always enjoy a glass of wine while you cook. 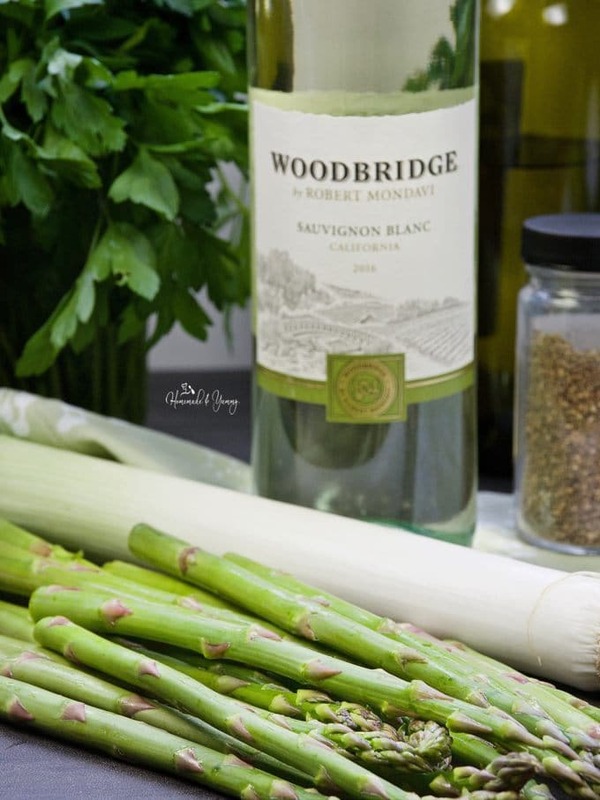 I like Woodbridge wines AND asparagus! YUM! I haven’t tried combining the two yet, but this is such a great idea! I want some! Well this is super easy. Hope you give this recipe a try soon. Yes the colour is nice…and the soup is delicious and so easy to make. Perfect for entertaining. I absolutely love asparagus and this soup makes me feel so happy about the spring weather we’re finally getting!! Gorgeous color and especially delicious with a nice glass of wine!! Hope you give this easy recipe a try…perfect for entertaining. This recipe is a keeper! Wine or sherry always adds that extra oomph to soups, I enjoy using it. Asparagus and leeks always go great together and I love how easy this is to put together. Can’t wait to try this, thanks for sharing this recipe! Hope you enjoy it as much as we do. Thanks for stopping by. We love asparagus and every time I buy some, the boys just want it roasted and they disappear right away. I need to sneak and save some from them to try the delicious soup. I have not gone beyond oven roasting them. 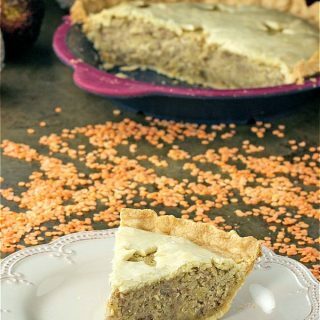 This is a great recipe to try with the asparagus. Roasted asparagus is delicious. I can see why it disappears to quickly. We enjoy eating it that way too. Well, I have a confession to make. I enjoy cooking with wine and I really enjoy just sipping it from a glass. I believe wine gives a depth to dishes — that extra YUM appeal. The asparagus soup looks so simple this is a recipe I’ll have to make. A soup makes a terrific light dinner or a special lunch. Of course, served with wine on the side. HHAHAH…yes sipping from the glass is a great way too….which we do!! I love asparagus soups but here they are so expensive to buy even in season. This looks and sounds so delicious. I love the pretty color you have. That wine looks so elegant and sounds perfect to go with a soup. Yum! Well luckily for us asparagus is not expensive. This soup is so easy to make, and is the perfect start to a dinner party. I love cooking with wine. And, I love Robert Mondavi wines! We actually got to do a tasting on a recent trip to California. I love that you used it in this perfect spring soup! Spring is also taking it’s time around here! Yes these wines are delicious (and affordable too). This is the perfect start to a meal, and so easy to make too. I LOVE all things asparagus! This soup looks delicious! I love easy and delicious recipes. Looks so comforting and delicious. Perfect for entertaining. Thank you for sharing! It is so easy to make this elegant soup. Hope you give it a try. I love asparagus and always look forward to making new recipes when it comes in season! Your soup looks delicious and easy and I can’t wait to make it! ENJOY…this is super easy for sure. This is my kinda soup it sounds absolutely delicious! Yes this is so easy, and perfect for entertaining too. What a great recipe. I love wine and asparagus and cheese! 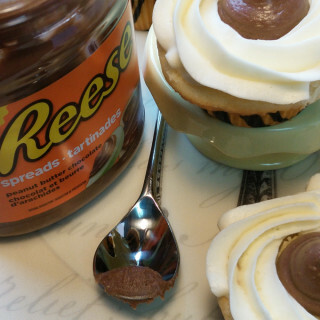 This is a recipe I need to try! Hope you give this easy and delicious recipe a try soon. ENJOY!! HAHAH….well you get the best of both world’s in this recipe. ENJOY!! Thanks so much for stopping by. Hope you give this recipe a try soon.